I believe that Washington DC is one of the best cities in the United States to visit, and not just because I’m a local! I grew up only 15 minutes outside of DC in northern Virginia, but as a kid I naturally wasn’t too impressed with the city. As I got older and traveled a bit, I finally came to appreciate DC and all it has to offer. Even though Washington DC is America’s capital, it isn’t packed with skyscrapers or even high rises for that matter. The city easily makes up with this with its architecture, diverse neighborhoods, and history. The American Institute of Architects created a list of the top 10 favorite buildings in America, and six of these actually located here. 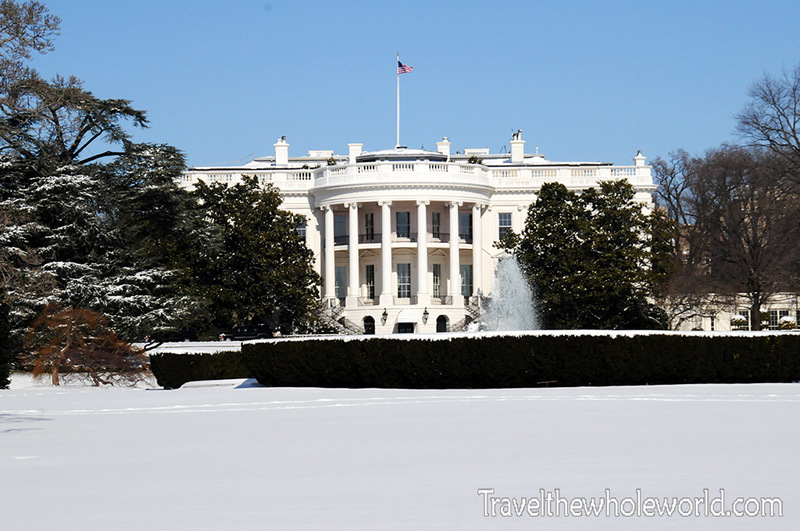 Above is America’s most famous home, the White House which serves as the home of the President of the United States. The White House is actually rated the second favorite building by the American Institute of Architects. 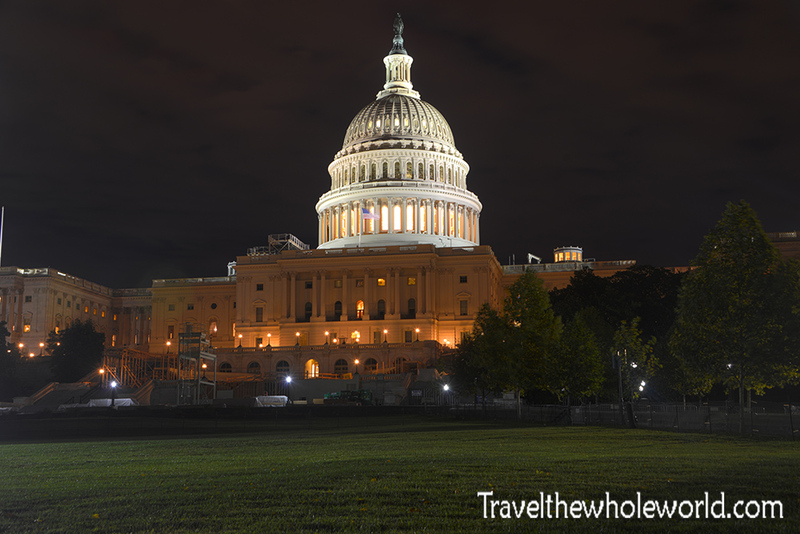 The capitol building is another icon of the city, and actually helped keep a low skyline in DC. Because of the Heights of Buildings Act of 1910, by federal law no building in Washington DC can exceed the United States Capitol’s height. This law has been revised a few times and comes with a few exceptions, but it’s the reason why you’ll never find skyscrapers in America’s capital! DC is also known for not having a large population. The city has only about 600,000 people, which comes way short compared to the millions who live in places like New York, Chicago or Los Angeles. When you’re in the heart of the city it feels more European like because of the smaller historic buildings and neighborhoods. 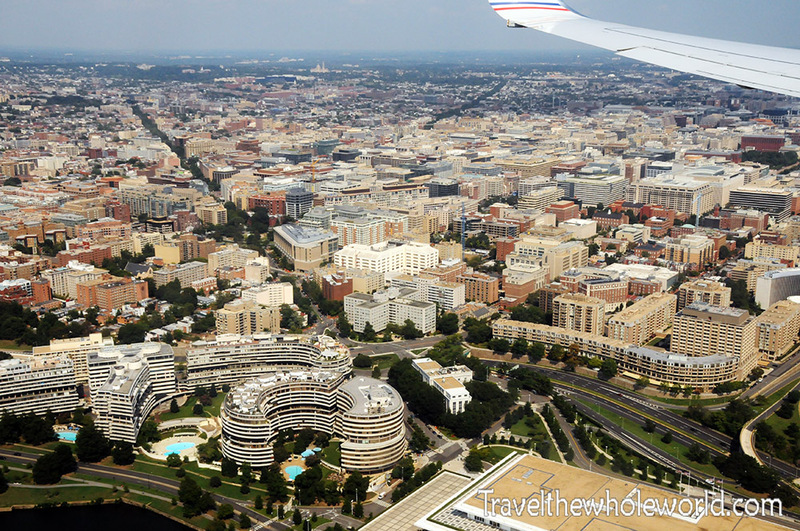 Since I love traveling I’m always flying in and out of DC, and constantly get aerial views where you can see the entire city. There’s an endless amount of things to see and do in DC but most of the most popular is to visit the city’s memorials and monuments. The Washington monument stands at 555 feet and 5/8th of an inch tall. Construction started in 1848, but the monument wasn’t completely finished until 1888. A lack of money from the Civil War and other issues halted the project for decades. If you notice the two different colors of the monument, you can see where construction stopped in 1857 and continued as a darker shade twenty years later. Probably most known about the mall are all the free world class museums, and somehow I lost all my photos of them! Since they’re so close by I’ll make a return one of these weekends and share some photos. They’re so many museums I could easily share a thousand photos of them. The most famous museums cover natural history, space and aviation, art galleries native American and African history. Aside from all the museums, the National Mall is also a place common for events, protests, and even of course relaxation. 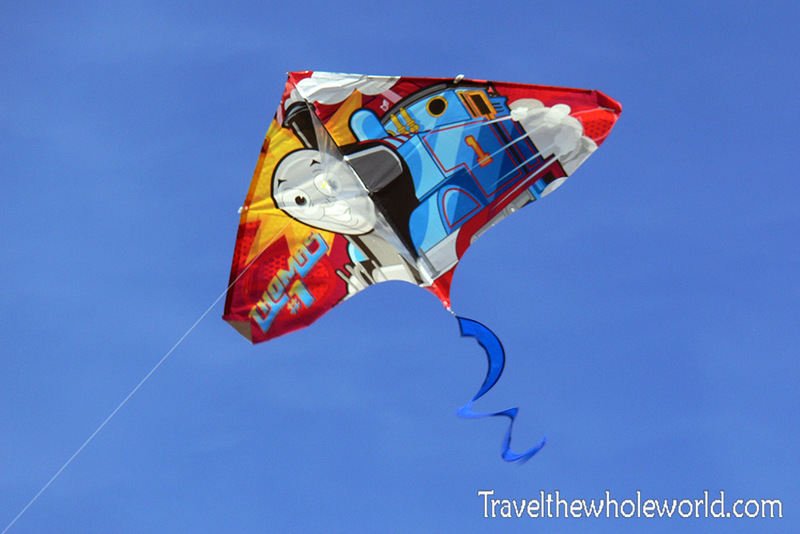 On one windy day I visited and there were over a dozen kite flyers. 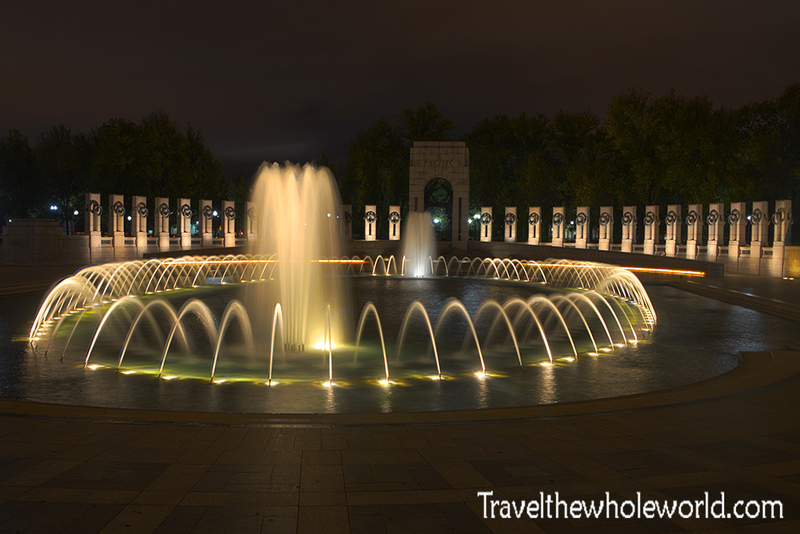 One of my favorite memorials in view of the mall is the World War II memorial. It’s relatively new and was completed in 2004 and dedicated by George Bush. 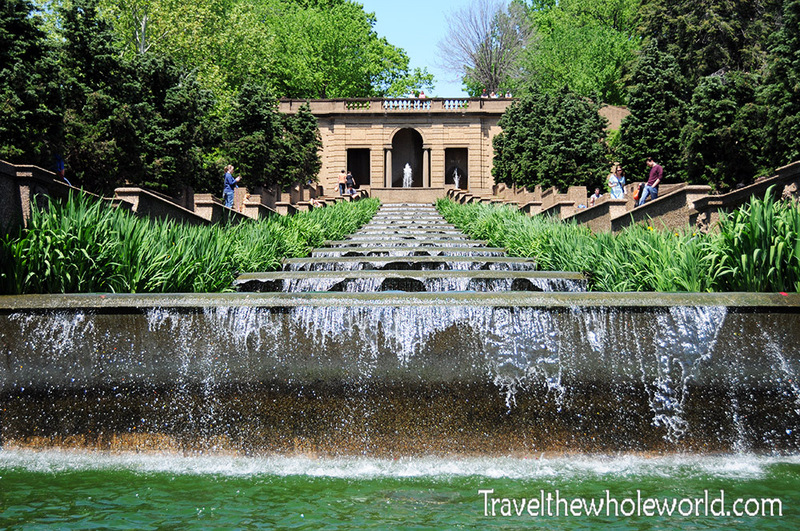 The memorial has a large pool and some beautiful fountains in the center surrounded by 56 stone pillars. 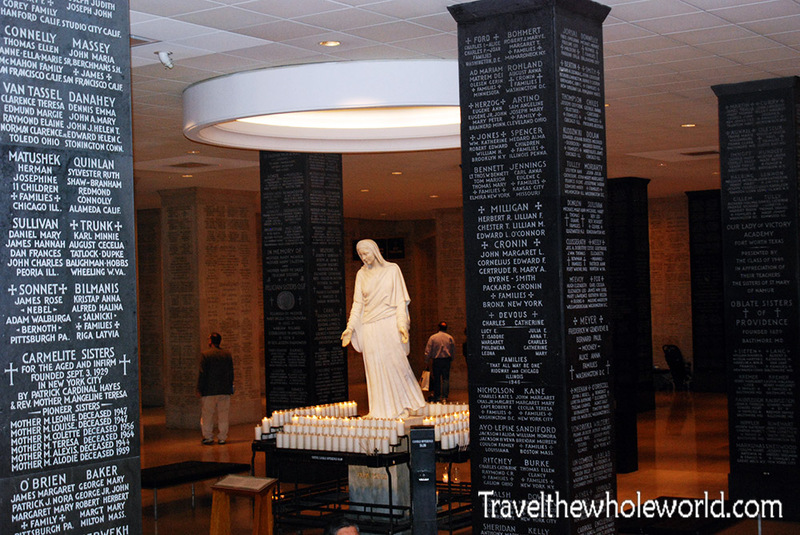 Each pillar is marked by one of the 50 states, and US territories, including the Commonwealth of the Philippines. I always thought the idea of choosing states and territories was a strange pick, but I can’t argue with the actual layout. 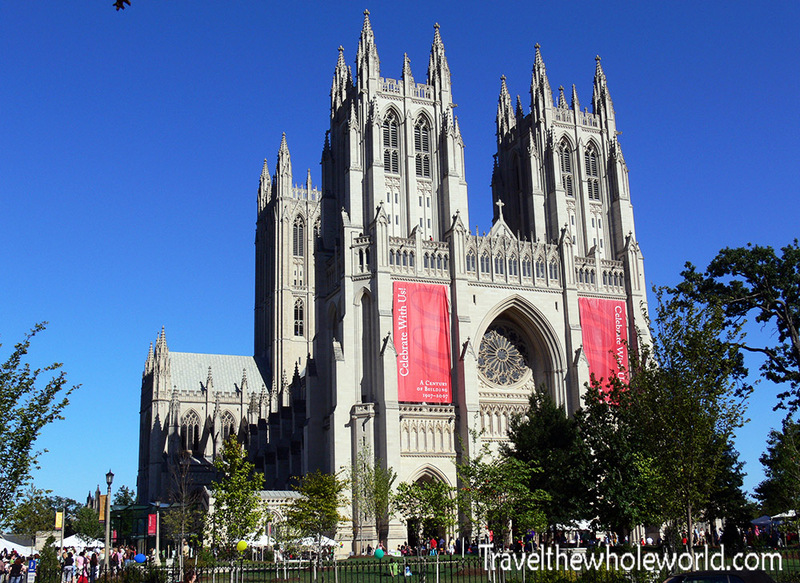 Above is the National Cathedral, officially named the Cathedral Church of Saint Peter and Saint Paul. The architecture of the cathedral was very impressive with its huge arches, gargoyles and stained glass windows and was voted one of the top three most beautiful buildings in the United States. Construction started all the way back in 1907 and wasn’t considered completed until 1990. This is now the fourth tallest structure in the capital and the second largest cathedral in the United States. It’s even the sixth largest cathedral in the world of the neo-gothic design. 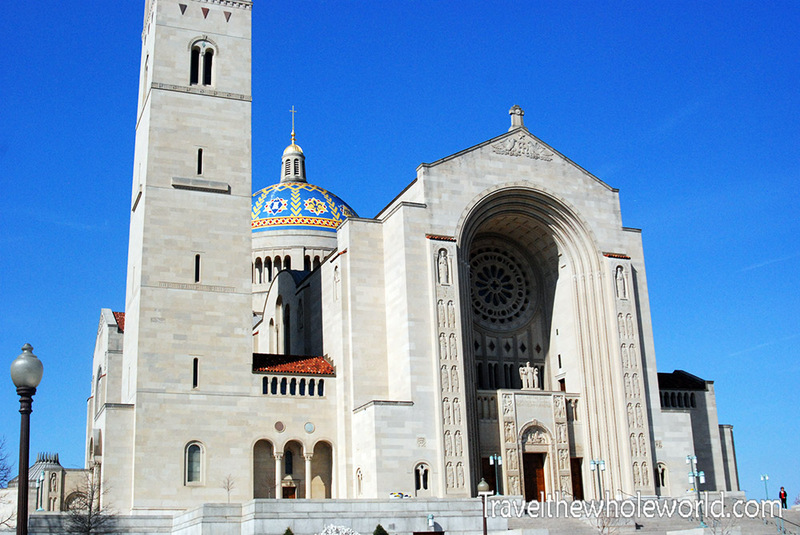 I think the most impressive church in DC is the Basilica of the National Shrine of the Immaculate Conception. What’s also impressive is that the vast majority of Washingtonians haven’t even heard of it. The basilica is actually the largest Roman Catholic church on this side of the planet, and surprisingly the 8th largest religious structure in the world! It brings in about one million pilgrims each year. The basilica is also one of the few structures that’s exempt from DC’s law regarding height, and is DC’s tallest building. One of the most interesting parts of the church to me was its underground crypt, which was modeled after ancient European Christian catacombs. On the left is the front side view, the right shows a photo of the crypt. Below is the tomb of the church’s founder, bishop Shahan found in the church’s crypt. On the right is a black depiction of the virgin Mary and baby Jesus. Another memorial that I’ve seen more times than I can remember, is dedicated to Abraham Lincoln. Despite multiple visits I somehow lost all my photos of the famous statue of Lincoln himself! This photo I took during a blizzard years ago. One sad part of DC’s history is Abraham Lincoln’s assassination in 1865 Lincoln had been watching a show at Ford Theater and was sitting in the presidential box when he was shot by John Wilkes Booth. This event was one that changed history for the United States and was one of the last major events of the Civil War. 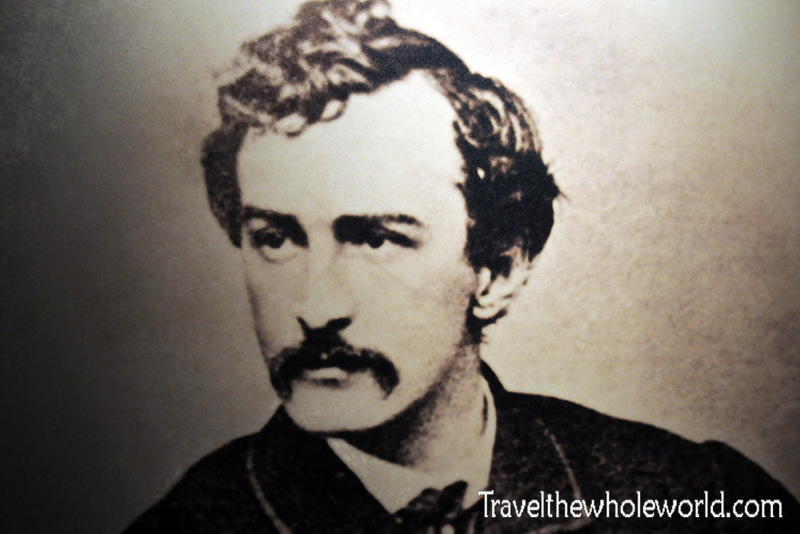 At the time, actor John Wilkes Booth was famous and considered a Brad Pitt of the era, and was able to use his celebrity status to gain access to the president. Ford Theater is still active but is also a museum as well. 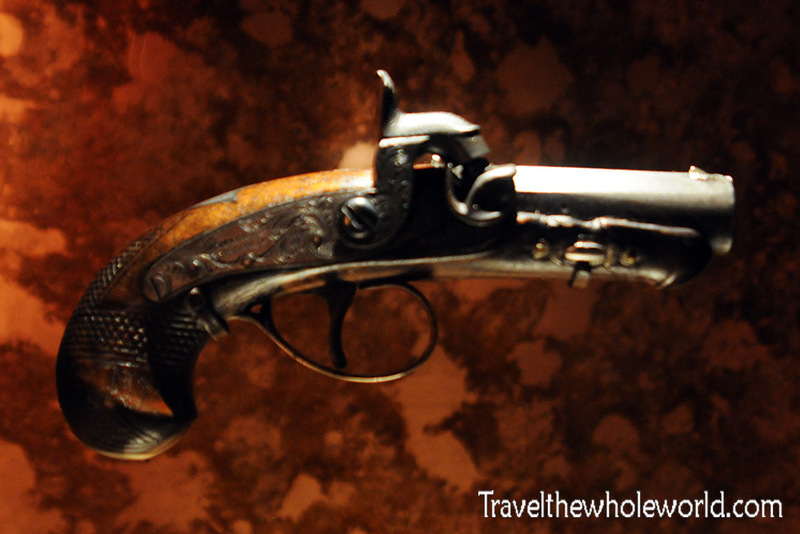 Above is John Wilkes Booth and below you can see the actual gun he used to kill President Lincoln. Another president who was assassinated was John F Kennedy. 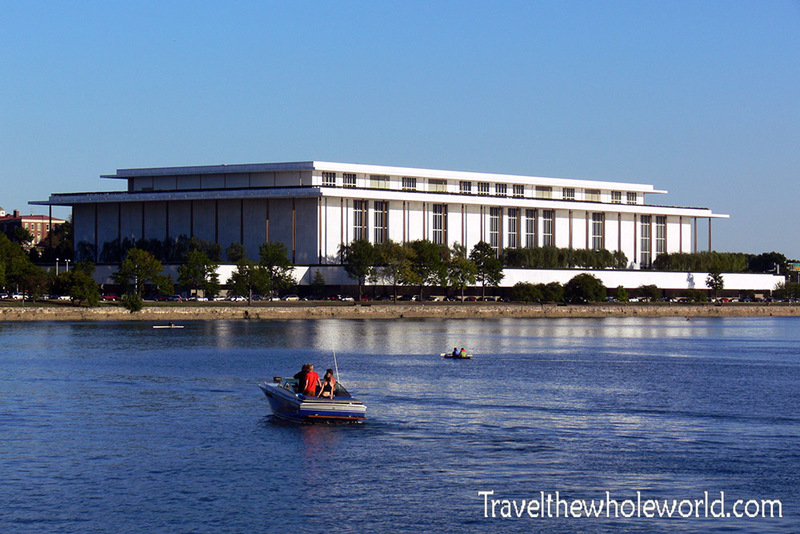 Although Kennedy was killed in Texas, the Kennedy Center in DC serves as both a memorial as well as a center of performing arts. Many plays, operas, concerts and other classy events take place here. I’ve only gone to a handful myself, but it’s been over ten years since my last visit. 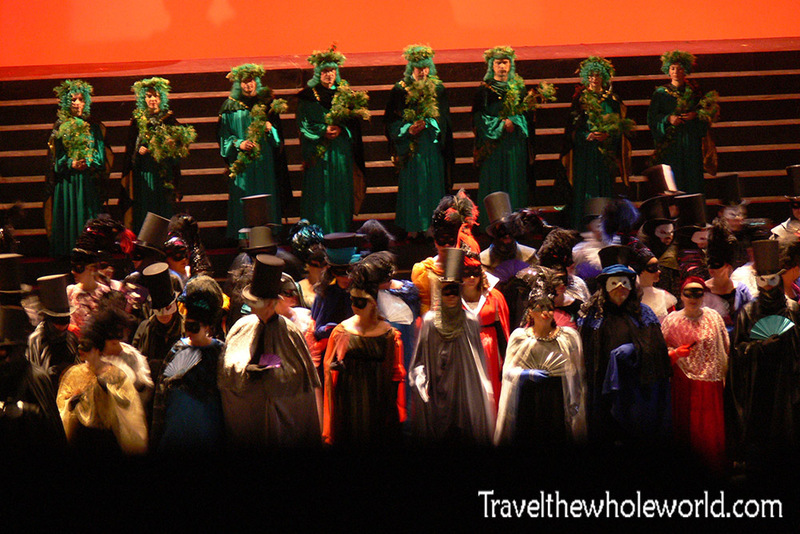 The photo below is of the end of a Russian Opera performance I last saw. The Kennedy center is a perfect place to go on a cold winter or rainy day. 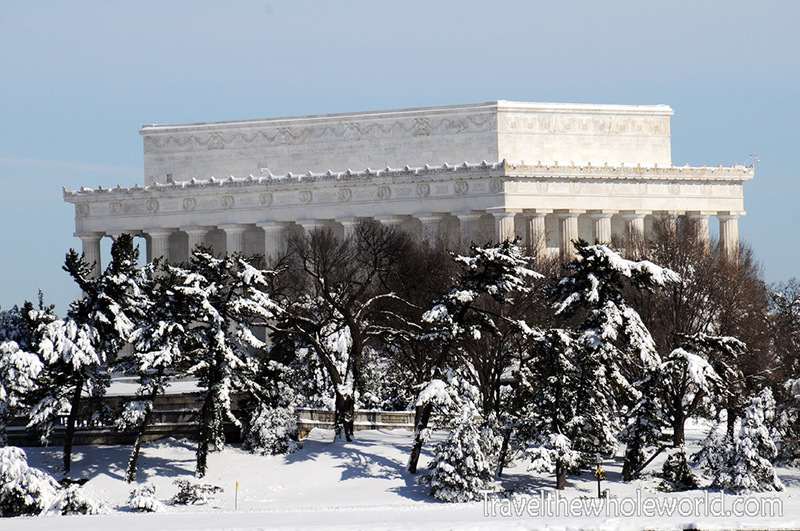 Normally no one would venture into DC during a snowstorm, but I had been away from home on business travel. I arrived right before DC got hit by the biggest blizzard since 1922. Since I had been gone so long, I refused to stay in and do nothing, and drove my two door coupe straight into the city. I had the entire highway to myself! The blizzard was nicknamed Snowmageddon, and the record storm dumped up to three feet (one meter) in some parts of the city, while most received at least two feet. 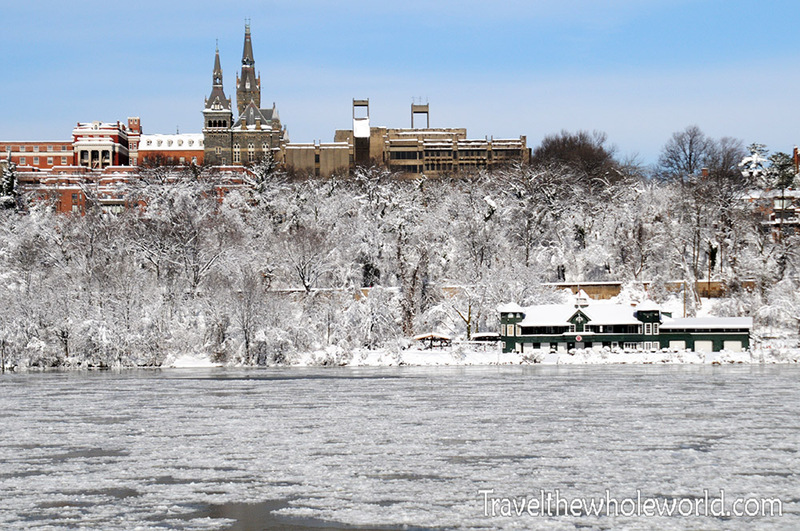 These two photos above and below show the frozen Potomac river by Georgetown. I must emphasize this is not a normal sight in Washington DC! Normally we one or two minor snow storms each year that completely melts away within a day or two. In 1772 both George Washington and Thomas Jefferson wrote about three feet of snow that shut own public services for nearly two weeks straight! I’d say that winter is the worst time to visit DC. If you’re lucky and catch some snow that might be an exception, but otherwise expect freezing temperatures and ugly dead trees. The best time would be in the spring or late fall. 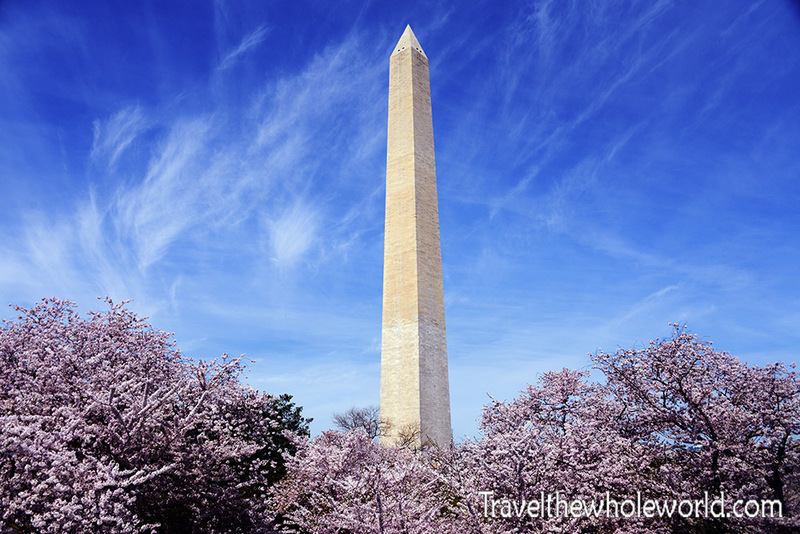 You may have noticed the earlier posted photo of the Washington monument was taken during the Cherry Blossom festival, which is one of the biggest events in the city. The festival brings an incredible amount of people and lasts several weeks. 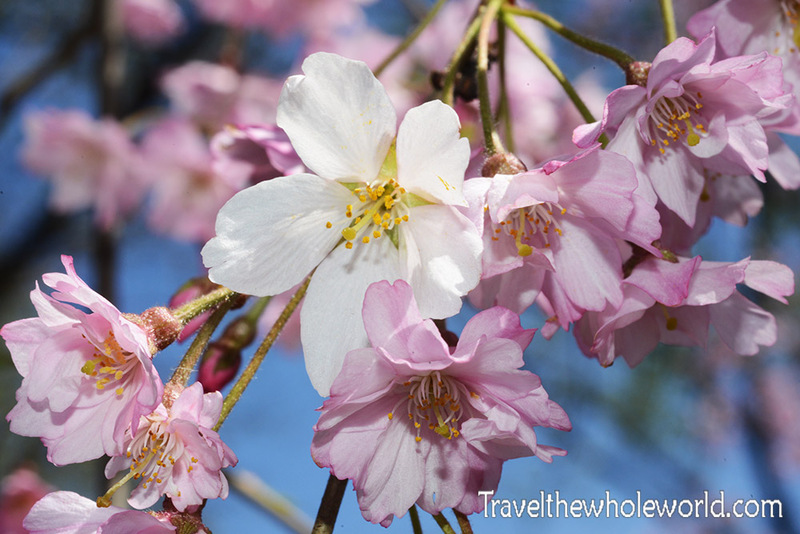 All of the cherry blossom trees were donated to the United States in 1912 by Japan. This was considered a gesture of friendship, so it’s hard to believe we had a major war only three decades later. After World War II, Japan became one of the United State’s strongest allies. Later when Japan had many of their own trees destroyed by severe flooding, the United States returned some from Washington DC to help them recover. 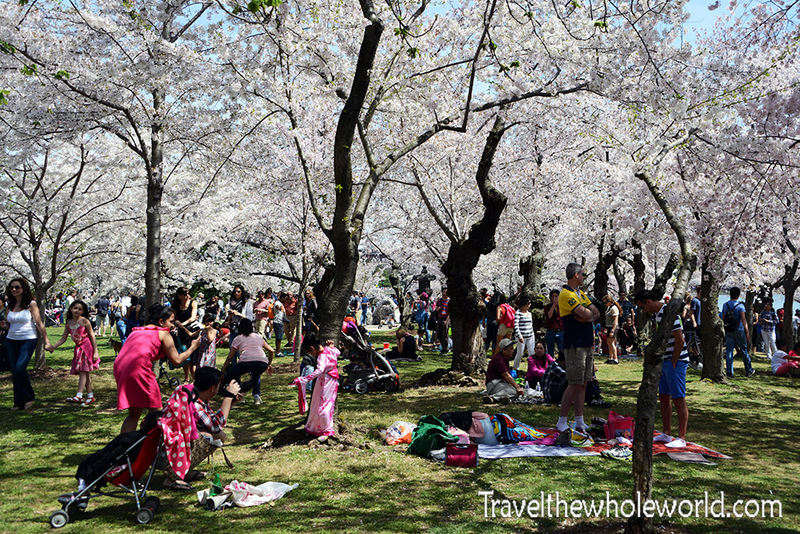 This Cherry Blossom festival brings in about 700,000 people annually. Other parts of the festival include food from Japan as well as Japanese beer and liquor, and a Japanese style parade. My favorite tree was this massive one I saw on the outskirts of the Tidal Basin. Sometimes the festival can get hit by bad weather, and you don’t end up with the best blossoms. One year when the weather was great I made it during peak weekend. Here’s’ a close up of the actual cherry blossoms, on a tree that has both white and pink flowerings. 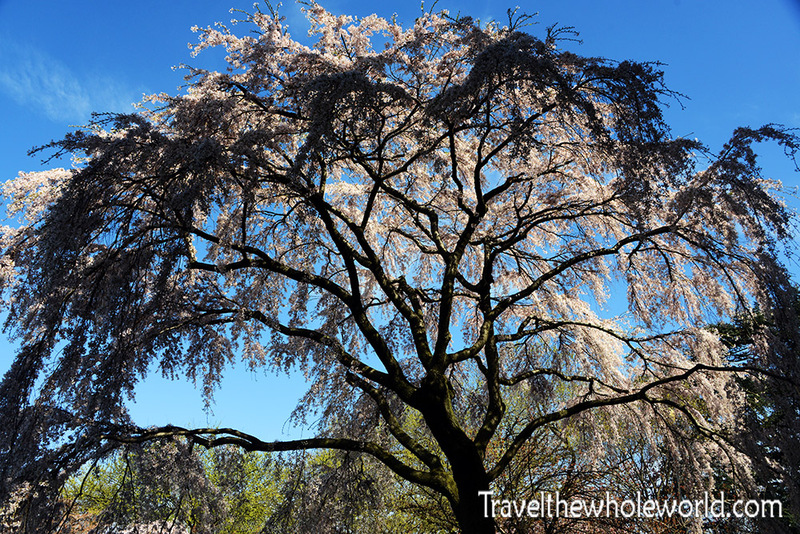 The most common type of cherry tree in Washington DC’s tidal basin is the Yoshino tree. They produce white blossoms while the more attractive Akebono trees produce the pink blossoms photographed here. 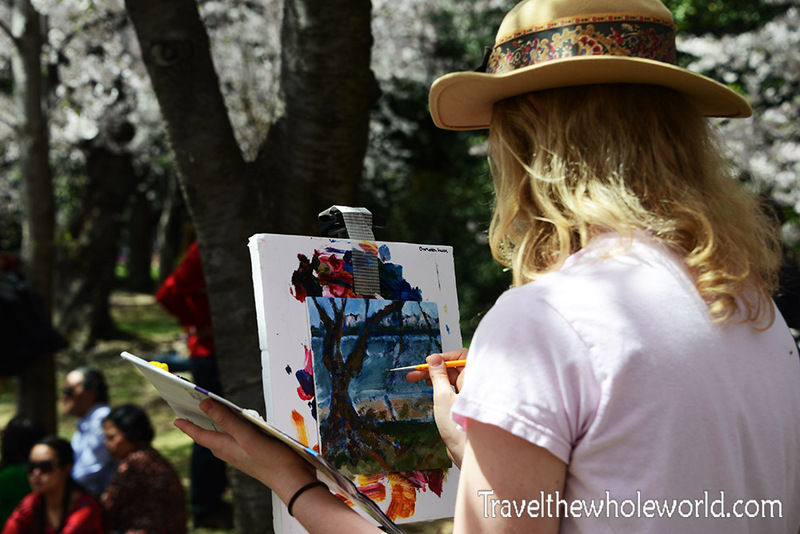 There are over 3,000 cherry trees in the tidal basin, but the vast majority are the Yoshino and the Kwanzan species. Each time I’ve come to the Cherry Blossom festival I’ve been so focused on the trees that I forget to pay attention to all the people. It’s amazing how many can pack into such a small area. This woman was in the middle of a massive crowd area but that didn’t stop her from setting up an easel and painting the scenery. The tidal basin covers a large area, so if you want to avoid the crowds there’s actually a few places that are a bit quieter. 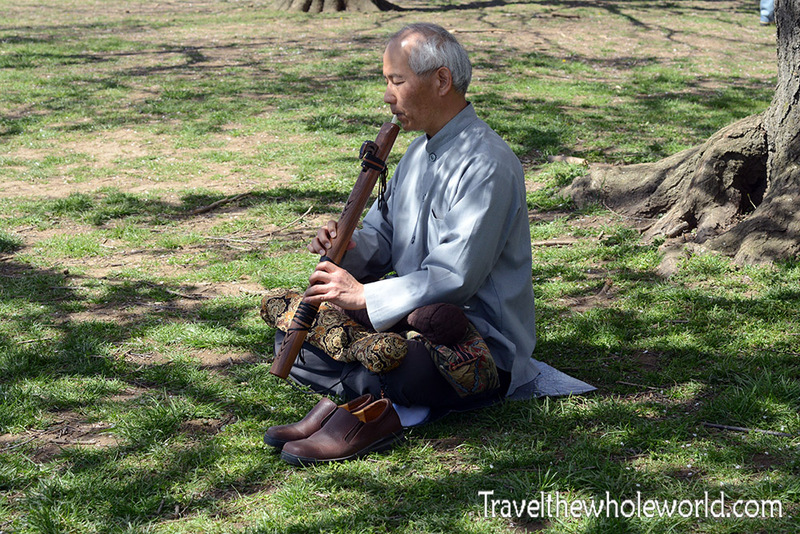 In one of these parts I came across this man was playing some traditional type of flute. 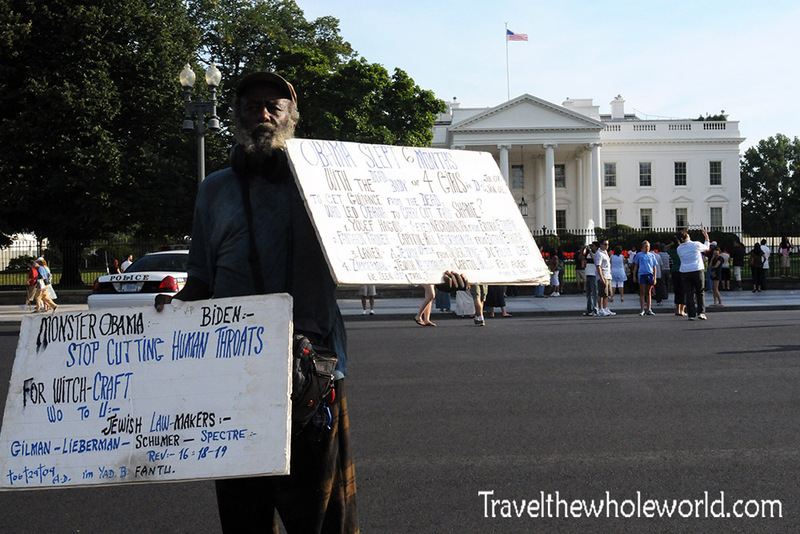 DC is a wonderful place to visit, and of course with all the good tourists there are occasionally a few crazies. This picture was probably more appropriate closer to the top of the page, but I didn’t want to start off with something so crazy so soon. I think it goes without saying that this guy likely is suffering from some type of mental illness and I honestly felt sorry for the guy. His sign was a bit entertaining though, claiming that Obama practiced witchcraft and had summoned a one eyed necromancer from Africa for guidance from the dead. I was a bit scared to ask to take his photo, but he seemed to be glad since I think he was happy to spread his message. At all times of the year you’ll find large amounts of tourists in the city. 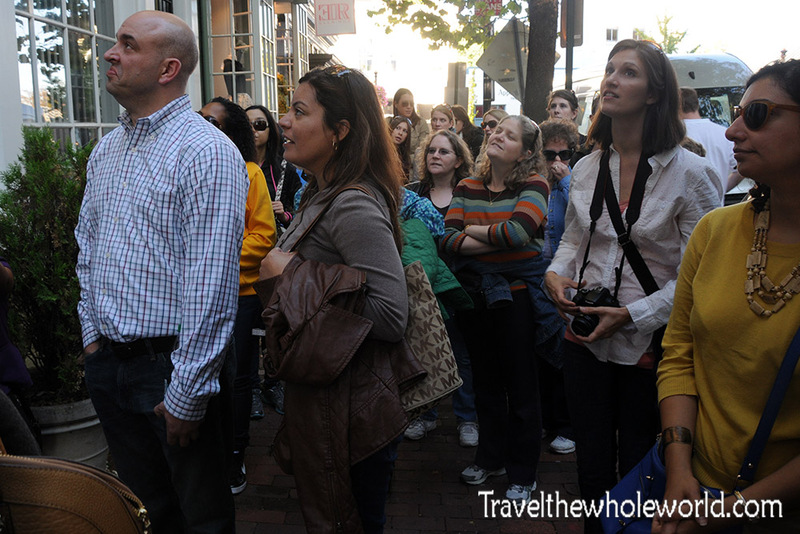 As a local I had never really done a tour until recently, and signed up for a Georgetown chocolate adventure one summer! Even though I’ve been to DC more times than I can remember, I had no idea that there was enough chocolate shops here to support a tour. We went to almost ten of them, and almost every single one was locally owned. I’d say that one of DC’s favorite neighborhoods is Georgetown. 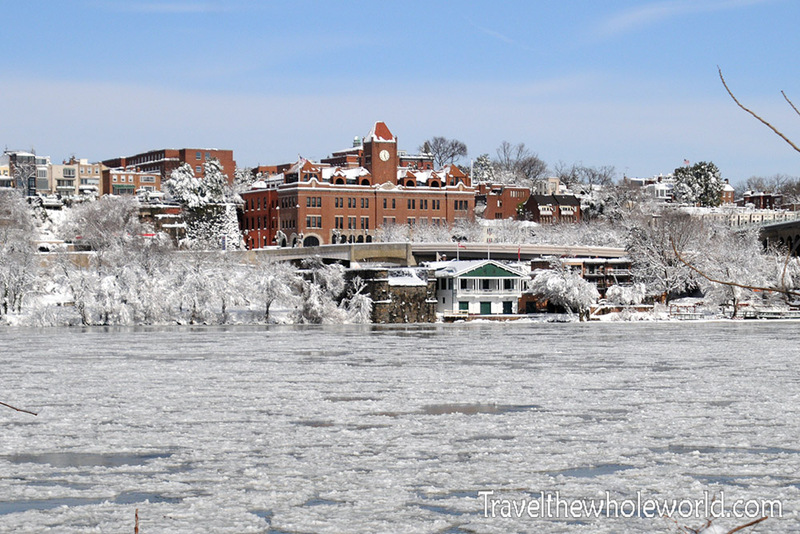 Georgetown is located along the Potomac river which makes a natural border between Virginia and Washington DC. The frozen river photos I posted earlier were from the outskirts of Georgetown where I didn’t see a single other person. 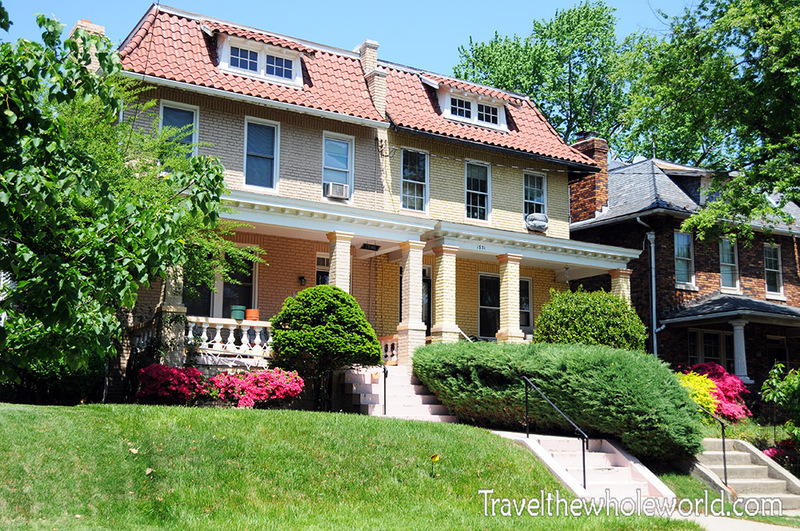 During the warmer months you’ll find lots going on in the upscale neighborhood. 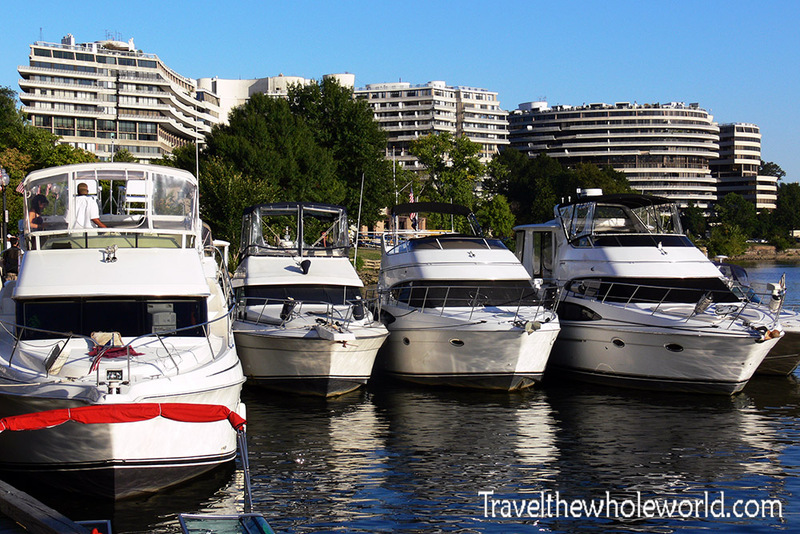 It’s even popular for people to pull up directly to Georgetown’s small waterfront in their own yachts! Most of the boardwalk area is roped off making it legal to have a drink outside the bars and restaurants, or in your own boat if you have one. When I used to go out for DC nightlife I almost always went to Adam’s Morgan which is a large strip of bars & clubs and is more much more casual than Georgetown. 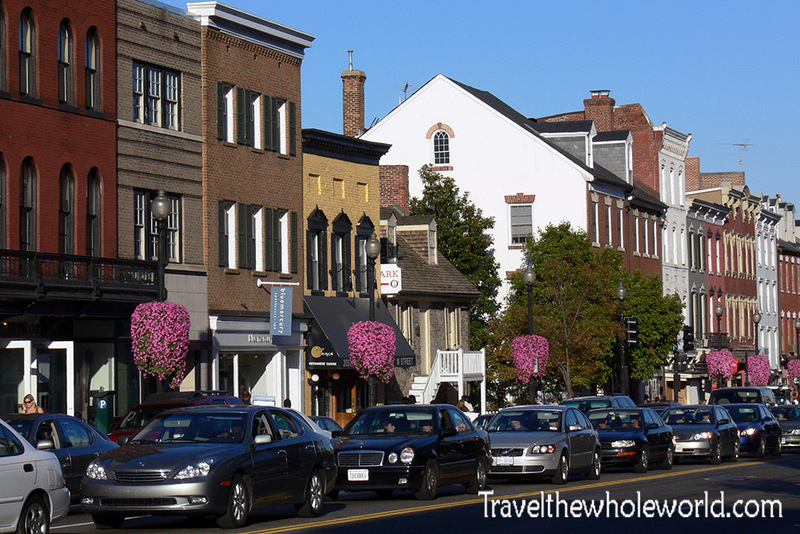 I eventually made the transition to where I found myself enjoying Clarendon Virginia or Georgetown in DC. Both are much nicer areas than Adams Morgan and I think have a better crowd, although by the time I hit 30 I found myself pretty much never going out at all! 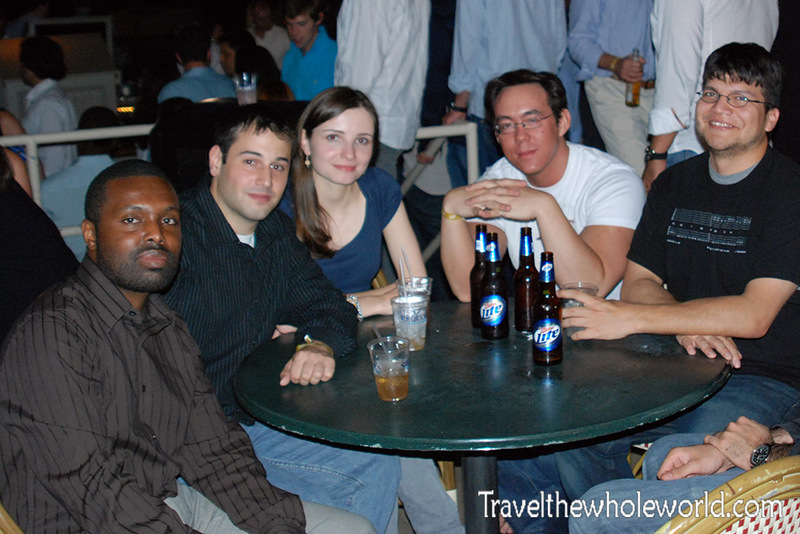 Below is a photo of some of my friends and I during my 27th birthday in Georgetown. I was a bit of a late bloomer and didn’t discover nightlife until I was around 23. At the time I came out to Adams Morgan with my friends almost every other weekend. Of course when you’re going out you never take pictures, but there was a night when my friend and I wanted to do something but not drink. We ended up driving around DC at night and stopped by Adams Morgan while I had my camera. 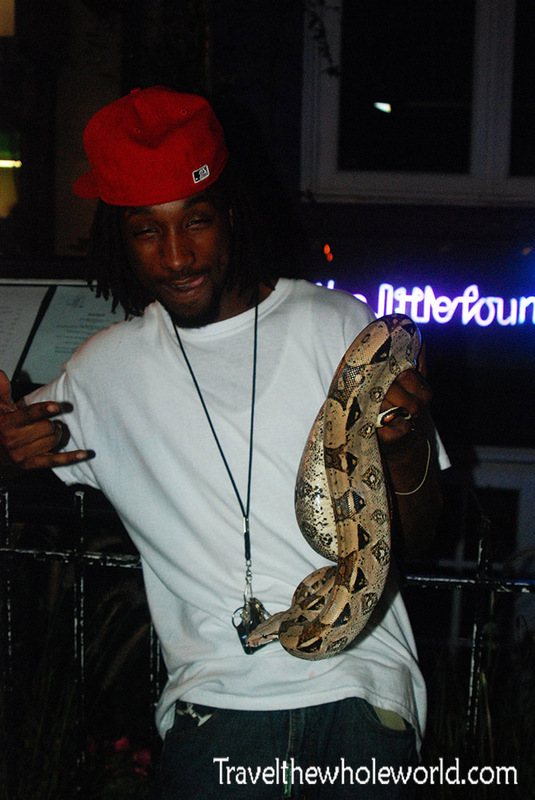 Above is a photo of the main strip in Adam’s Morgan, and below is someone I met holding his red tail boa. I used to have a snake growing up, so when asked if it was a Colombian red tail he seemed impressed. At one point Washington DC had the highest crime rates in the country. Violent crime has seen a significant decline but DC still tops the statistics as one of the more crime ridden cities in America. Almost all of these problems take place in Southeast DC, with the remaining parts being very safe and popular among both travelers and locals. Of course where there is lots of drinking and the ratio of men to women isn’t so good, fights are bound to happen. I’ve never seen a fight in Georgetown, H street, or other parts of DC, but Adams Morgan occasionally has a fight break out or two. I think this neighborhood is a bit like Dr. Jekyll and Mr. Hyde. During the day it’s actually a great place to visit for everyone, but at night it usually can be a bit rowdy. I still have to emphasize I think it’s totally safe, and out of the probably hundreds of times I came here during a ten year period I never saw anything too crazy. By chance though, the day I visited with my camera I did see this guy getting a beat down. 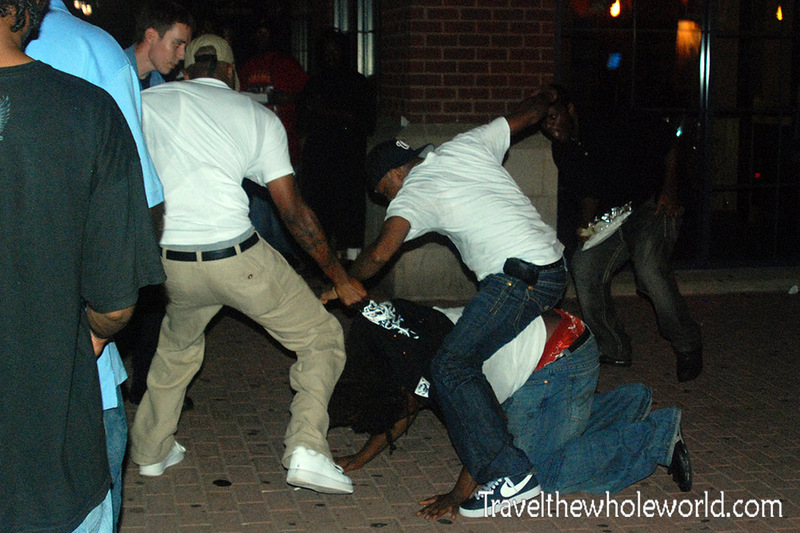 When I took the photo of the fight, some yelled about the flash from my camera. I had to escape and was lucky enough to not be the second victim that night. 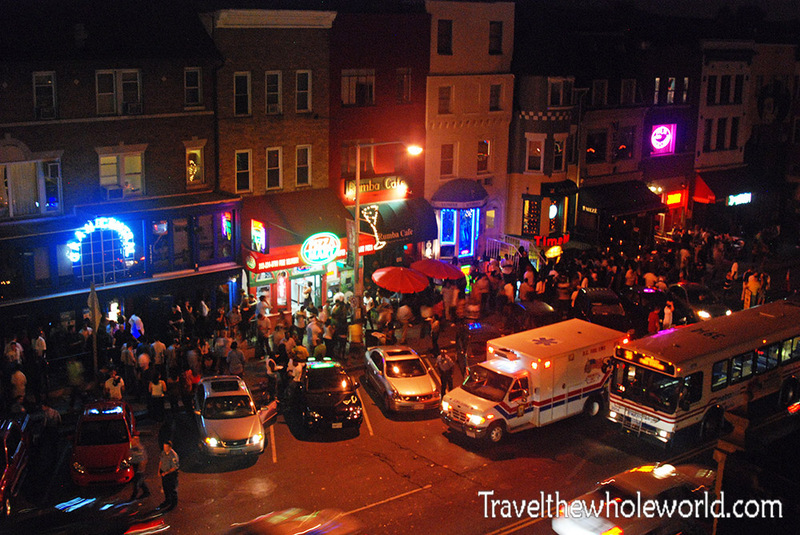 Adams Morgan has lots of police when the bars are open, so usually any fight gets broken up before it can get serious. 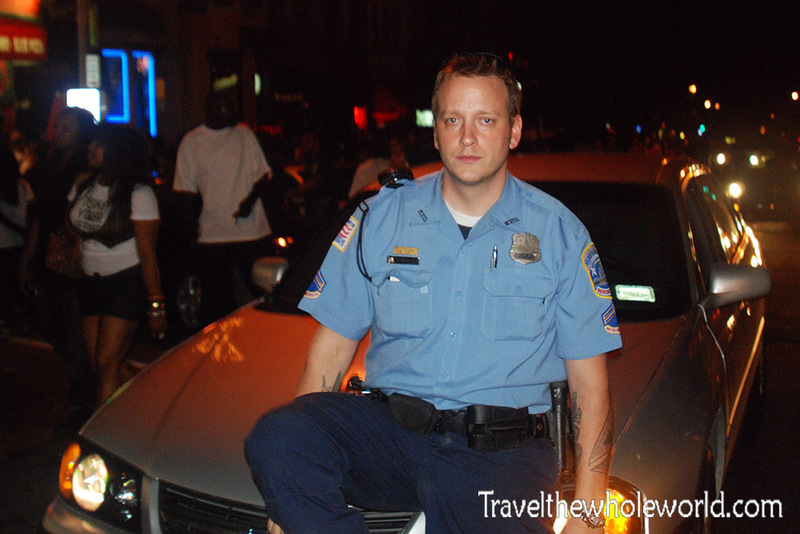 This police officer allowed me to take his picture, and afterwards I ran into him for the next few years, usually while I was intoxicated to his annoyance. 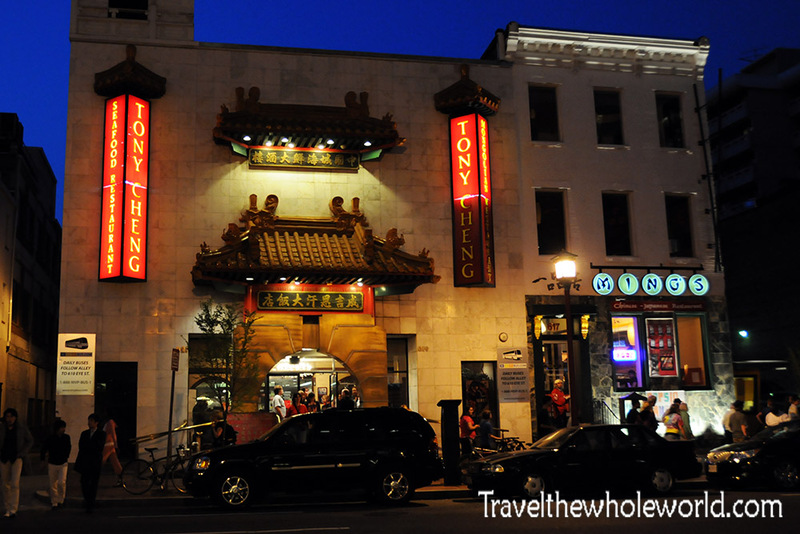 Another popular neighborhood in DC is Chinatown. The most famous structure here is the Friendship Arch, which was built in 1986. The arch reaches several stories in height, and is decorated with over 7,000 tiles and 272 painted dragons in the style of the Ming and Qing dynasties. I was a bit surprised to learn that this is the largest single span Chinese Arch in the world! The photo above shows a rare Chinese restaurant in Chinatown. I always found it odd that most businesses here were international, but I finally found out why. Apparently some devastating riots in 1968 coupled with rising crime during that period encouraged many Chinese immigrants to make the decision to move to Virginia and Maryland. As the city recovered Chinatown became a popular destination again but only about 20 Chinese and Asian businesses remain. While of course there are Chinese businesses, much of the neighborhood has turned international, and its even the home of the Washington Caps, DC’s hockey team which plays at the Verizon Center. For everyone else here, zoning laws still require their businesses to have signs in both English and Chinese characters. This forces businesses such as Starbucks and Fuddruckers to put Chinese on their doors and windows, but otherwise any type of business can move in. 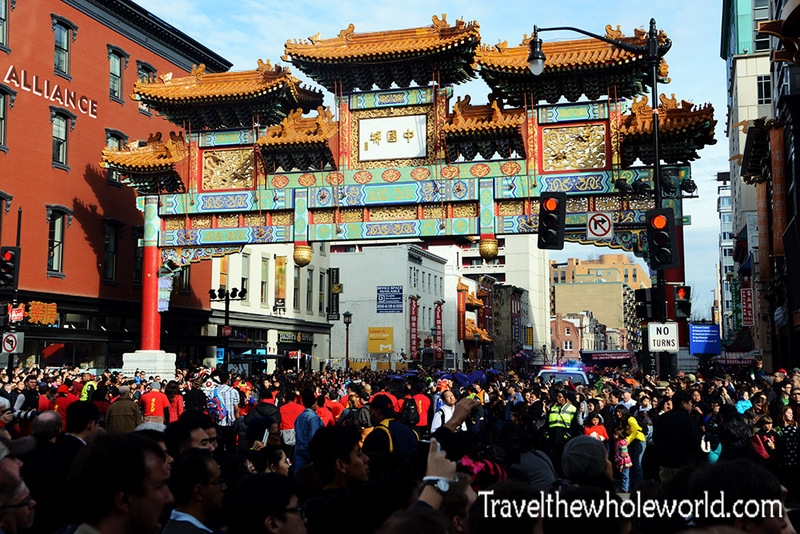 The best time to visit Chinatown is no doubt during the annual New Years festival. 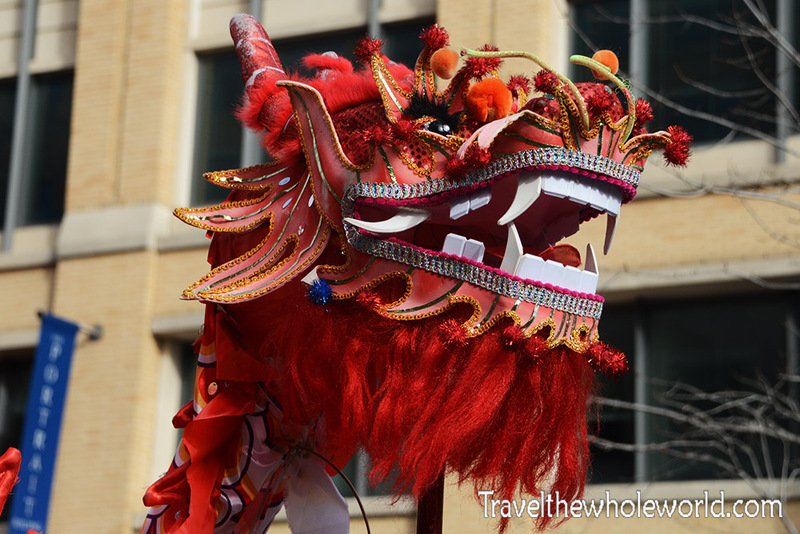 I wasn’t even aware that they had a Chinese New Year Festival in DC. I was actually in Kinkos shipping out some parts when I overheard someone talking about the event the coming weekend, and if it wasn’t for that I would have never made it. The best part about the festival was the New Years parade. This Chinese dragon was one of probably 100 different creations that zigzagged down the street. The Chinese New Year’s had lots of local organizations such as Chinese language schools and visitors from the Chinese embassy. There were calligraphy classes available for those who wanted to practice writing, and even the DC mayor was there. 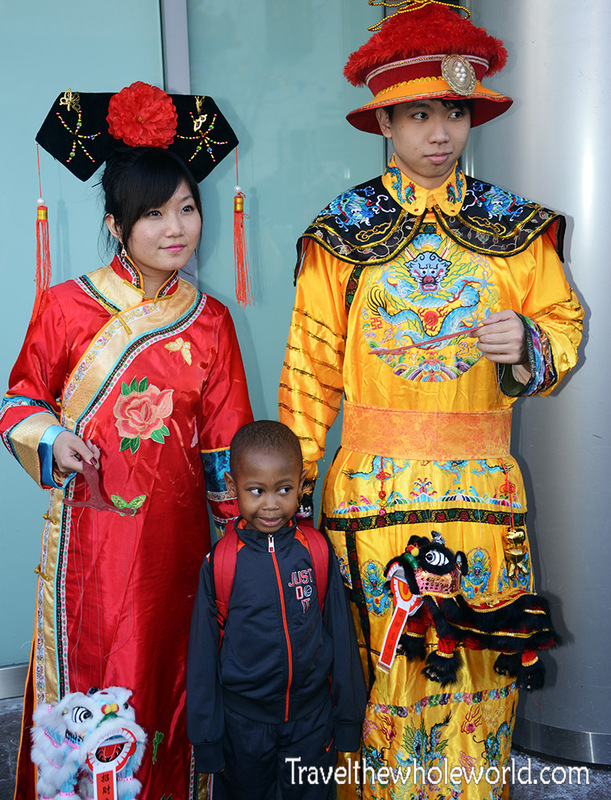 Of course there were hundreds of people wearing traditional Chinese clothing that allowed people to take photographs with them. An unexpected place for some in DC is a small but thriving seafood market; this place has been in business since 1805! 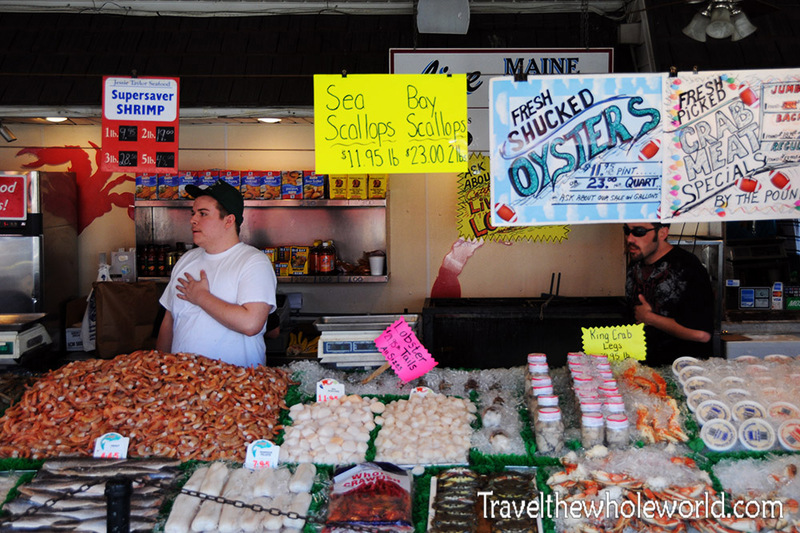 The market is located right by one of the main bridges going from Virginia into the city, and occasionally I can even smell the seafood from the highway. I’ve never been a fan of seafood myself, but for those who are this is an excellent good place to get some. I have memories of coming here as a little kid and attempting to hold my nose while my father shopped around for crabs. 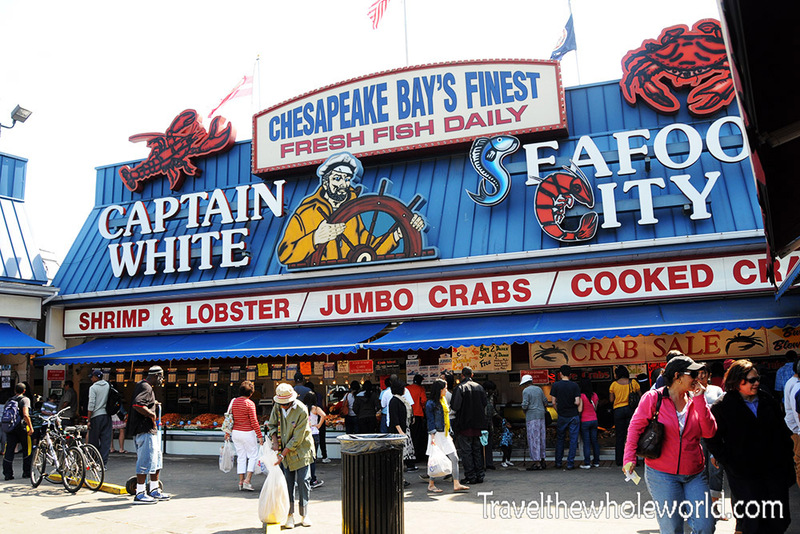 The vast majority of the seafood was caught in the nearby Chesapeake Bay, which is located in both Virginia and Maryland. Throughout DC are plenty of city parks, with statues and memorials dedicated to just about anyone you can think of. In my days where I used to go out, it seemed that 16th street always had guaranteed parking at night. I walked down this street along a massive stone wall more times than I can remember. I had always thought the wall was built around a cemetery, until one day I took a peak inside. I was a bit surprised to see what would later become my favorite city park in DC. There’s over a dozen statues and memorials here, a massive waterfall, and often people doing yoga classes and other activities. 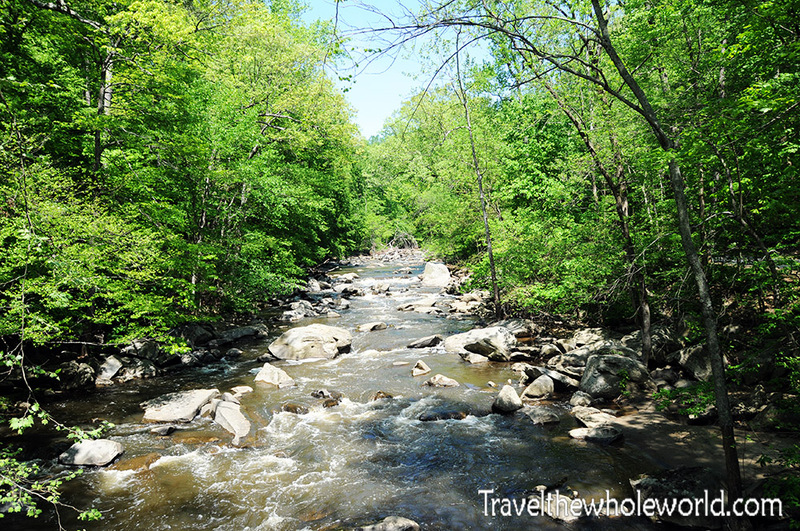 In the middle of Rock Creek park is one of the best and largest zoos in the country. Best of all, it’s free! 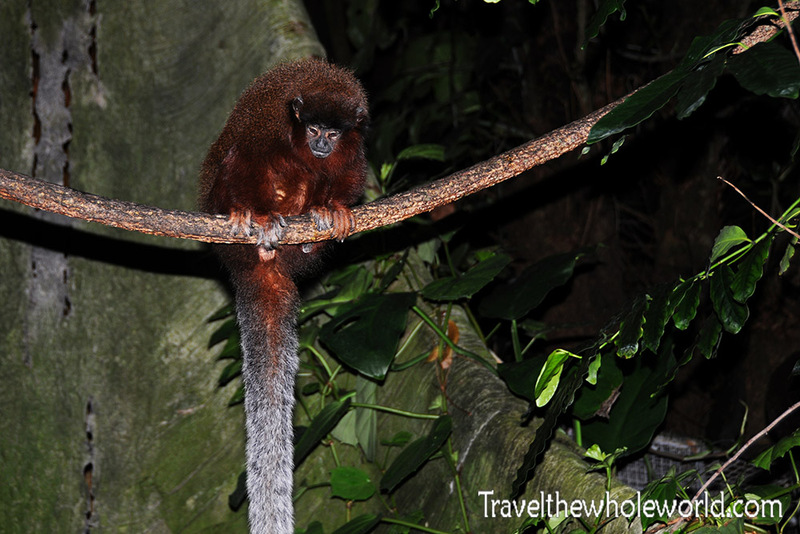 The zoo has a wide range of animals from large African cats to smaller insects and reptiles. I’ve gone here at least a dozen times when I was a kid and always had a great time. I could easily add 50 photos from the zoo alone, but since I’m out of space on this page I had to select two. The monkey above wasn’t so much as impressive as the environment he was in. My favorite exhibit has always been the Amazonia. You enter the Amazonia through two sets of double doors, to keep both the humidity and the animals inside. Once in, you’re in an enclosed area where birds, small reptiles, monkeys, and even fish in large ponds are free to roam. 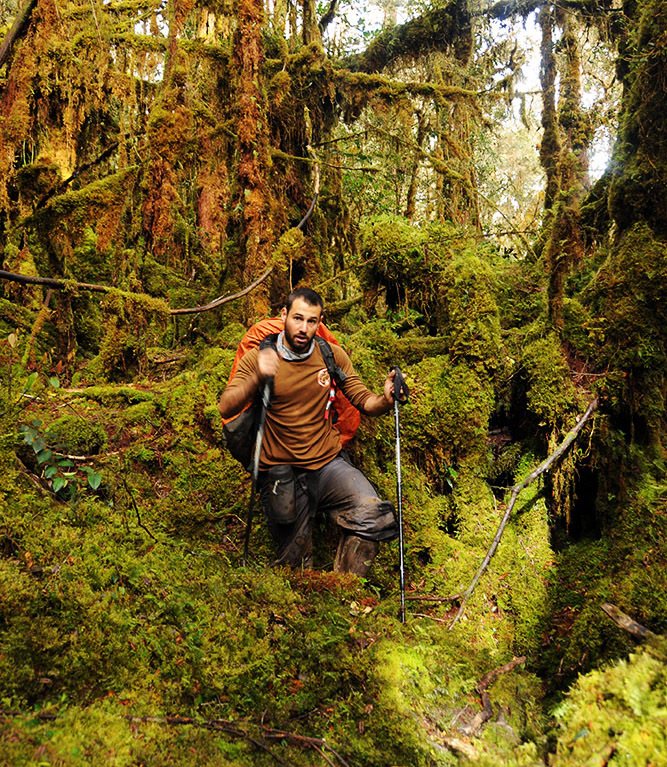 I’ve heard somewhere in here there is even a sloth roaming about! Of course lions and tigers will always be impressive, but since I’ve seen them so many times I found this Andes bear to be a real treat. The reason why is because many believe wrongly believe that bears live in the southern hemisphere. South of the equator there are no bears at all actually, except of course this sole species. 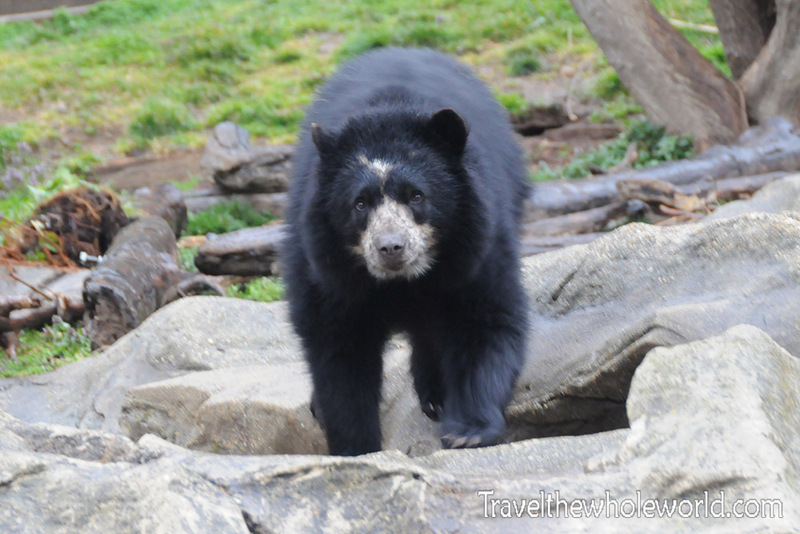 The Andes bear lives in the mountains of western South America, and the national zoo is the only time I’ve ever seen one. In case you’re wondering, Koala bears are not true bears! Despite DC being a small city, there’s still enough room for nature. 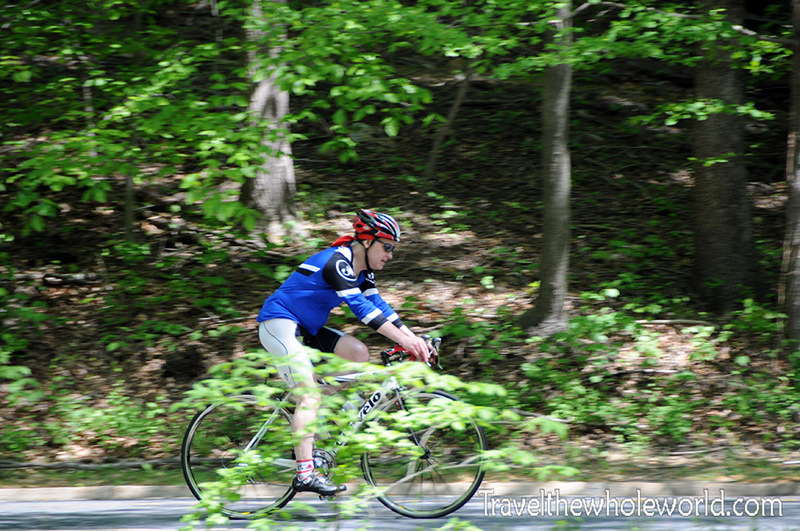 Rock creek park surrounds the national zoo and covers nearly three square miles of woodlands. It’s even a small refuge for wildlife. Deer, foxes, raccoons, snakes and other animals are well established here. Above is a photo of the forest and Rock Creek itself. When you’re actually in Rock Creek you’ll probably feel like you’re far from any city rather than just a few miles from the White House. Even though Rock Creek is surrounded by millions of people from DC, Virginia, and Maryland, it never seems to get overly crowded, even on a nice day. 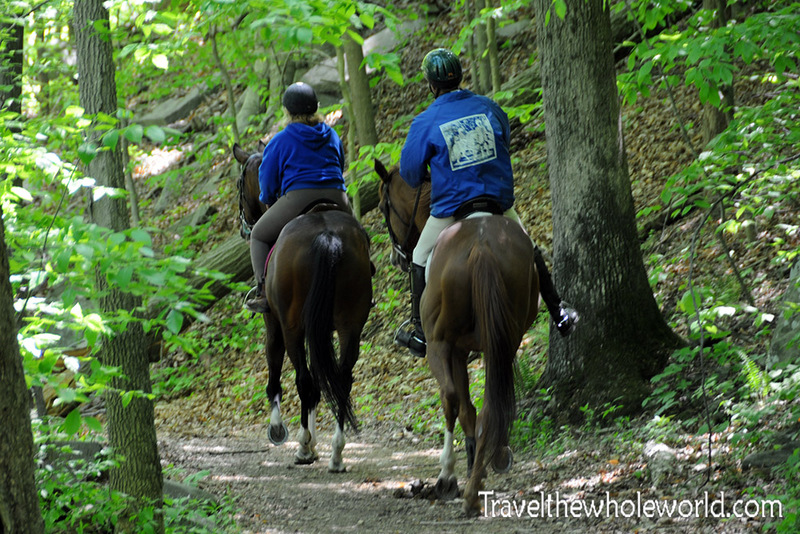 There’s a surprising amount of outdoor activities available here, everything from jogging, mountain biking, and even horse riding. Perhaps the only thing that is missing is any camping facilities. I’ve seen deer, squirrels, and plenty of birds in Rock Creek, but I’m fairly proud to have this photo of a fox. 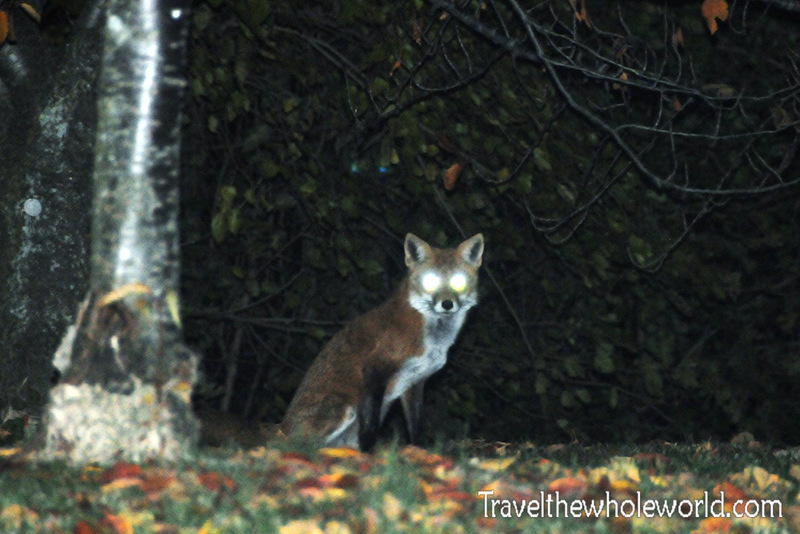 It’s not a great photo of course, but considering there was low level light and spotting a fox requires a bit of luck in DC I can’t complain! 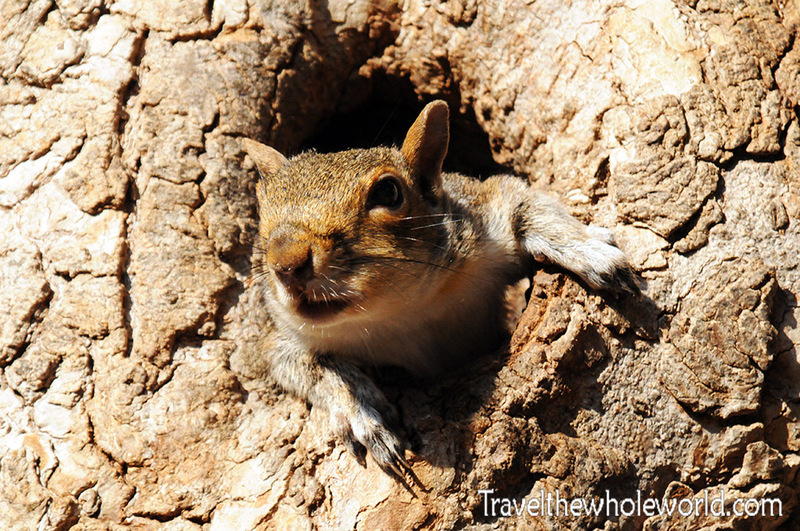 In the rest of the city, one thing you can’t miss is all the squirrels. They’re pretty used to people, and some of them may even come close enough to take food directly from your hand. This squirrel took up some prime real estate in the heart of the city. The real estate right outside of Rock Creek park is among the most expensive in the city. It’s only of the few places in the city where you can find single family homes, or duplexes with large yards. If you’re rich and want to be a Washingtonian, than some neighborhoods in northwest are the place to go. The smallest of these houses will over a million bucks a piece.